Developed in 1966 by Albert Humphrey and colleagues at SRI (first as SOFT), SWOT (Strengths, Weaknesses, Opportunities, Threats) analysis was a model and framework created to help then-newly-emergent corporate planners. SWOT asks executive staff to identify the good and bad in current organizational operations (Strengths and Weaknesses), and the good and bad in the current or future operating environment (Opportunities and Threats). SWOT analysis thus typically occurs on two axes (internal-external, and current-future). It was initially done in six planning categories: Product, Process, Customer/Sales, Distribution/Market, Finance, and Administration. 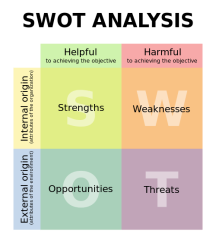 By the 1980s, SWOT had grown quite popular in organizations of all types, and was also being used by non-management stakeholder groups. In typical political environments, the SWOT input process tends toward group feedback that is mostly about small suggested changes, fixes and wins (internal-current feedback), with a minority of “big ideas” (external-future feedback) submitted by the more innovative (or politically risktaking) members of the group. Leadership then filters all this feedback in various ways and decides if any of it changes strategy, plans, and actions. Humphrey believed that the CEO should be oriented to growth strategy and planning, not managing current operations, which he proposed leaving to the COO. See his article, “Managing a Downturn” (2005) for more, and his observation that organizational foresight and strategic agility become most valuable during economic downturns and other catastrophes. But good foresight and agility processes can’t be built overnight. They need to be in place, and properly exercised, ahead of those inevitable shocks and stresses, when the firm’s survival may depend on them. To strengthen organizational foresight capabilities, regular brief SWOT or alternative strategic analysis by your client’s executive team is one good habit to start.